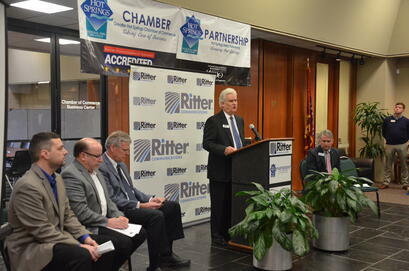 Jonesboro , AR (February 15, 2019) - Ritter Communicaions, the state’s leading broadband provider, announced that it is bringing state of the art communications technology and advanced business services to Hot Springs. Ritter Communications, headquartered in Jonesboro, is investing $7 million in infrastructure construction to give businesses in the Spa City access to the highest speed, 100 percent fiber internet, voice, cloud solutions, networking and television services by late summer. Ritter Communications, founded in Marked Tree, Arkansas and headquartered in Jonesboro, began providing local phone service in 1906. Today, Ritter Communications serves 89 communities and more than 45,000 customers across Arkansas, southeast Missouri and west Tennessee. The family-owned company has grown steadily over the years, expanding rapidly since 2010 and is now the largest locally owned regional fiber, telecom, video and cloud services provider in the state. Ritter Communications invests heavily in the communities it serves by deploying proven, best-in-class infrastructure and technology while coupling it with a world-class customer focused experience. The company is a wholly owned subsidiary of E. Ritter and Company, which also operates Ritter Agribusiness and Ritter Investment Holdings.